Vanderbilt University’s Neuroscience Graduate Program has been named the 2012 “Program of the Year” by the Society for Neuroscience. The award was presented Sunday, Oct. 14, during the society’s annual meeting in New Orleans. With more than 42,000 members, the society is the world’s largest organization of scientists and physicians devoted to advancing understanding of the brain and nervous system. The Neuroscience Program of the Year Award recognizes excellence and “the most significant and impactful innovations” in educating neuroscientists that can serve as models for training programs worldwide. “Founded in 1999, the Neuroscience Graduate Program has grown into one of the premier biomedical graduate programs at Vanderbilt and in the nation,” said Mark Wallace, Ph.D., director of the Vanderbilt Brain Institute (VBI), which administers the program. “Trainees from our program typically go on to do postdoctoral fellowships in the best laboratories across the world, and many have now transitioned into faculty positions at premier academic institutions,” Wallace said. Currently there are 81 graduate students in the interdisciplinary, trans-institutional program, which has a strong emphasis on innovative community outreach and service. 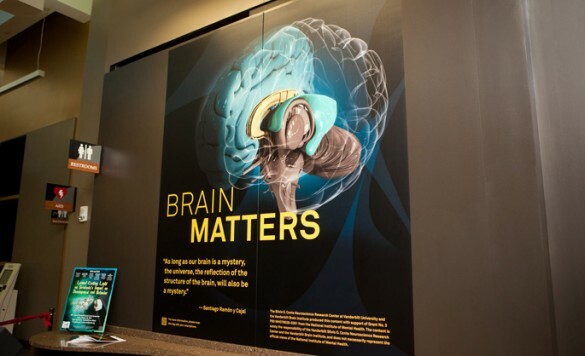 An example of that innovation is “Brain Matters,” a series of educational, interactive exhibits installed last year at the Vanderbilt Health One Hundred Oaks clinical campus. The goal is to provide information about brain science and mental health to the greater Nashville community. “Brain Matters” resulted from a partnership between the VBI and the Vanderbilt Silvio O. Conte Center for Neuroscience Research. It was funded by the National Institute of Mental Health, part of the National Institutes of Health (NIH), through a supplement to the Conte Center grant. The project was managed by Christopher Ciarleglio, a newly minted neuroscience Ph.D., who now is a postdoctoral fellow at Brown University. Current graduate student Andrew Hardaway and his team continue to develop content for the exhibits. Another community event, coordinated by a committee of neuroscience graduate students, is the annual “Brain Blast,” part of Brain Awareness Month, which is sponsored by VBI and the Middle Tennessee chapter of the Society for Neuroscience. This year’s Brain Blast attracted more than 1,000 people for a day of brain awareness activities at Vanderbilt Health One Hundred Oaks. Neuroscience graduate students also participate in a number of science programs hosted by Vanderbilt for high school students and undergraduates. The Neuroscience Graduate Program is supported in part by NIH grant 3T32MH064913. The Conte Center is supported by NIH grant P50MH096972.